Boeing has long committed to cleaning up the Santa Susana Field Laboratory (SSFL) to a level that would be safe for people to live there, even though it said residences on the site weren’t anticipated, in order to protect the tens of thousands of people who do live nearby and are at risk from the migrating contamination. and says it instead wants to leave a thousand times higher concentrations of contamination than it promised. Don’t let the DOE walk away from its SSFL cleanup commitments! 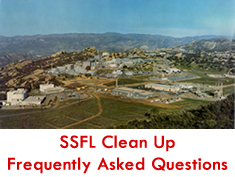 The Department of Energy (DOE) is attempting to break its obligation to clean up all of the nuclear and chemical contamination at the Santa Susana Field Laboratory (SSFL), proposing instead to leave as much as 94% of the contamination not cleaned up. Click here to submit a comment and demand a full cleanup! The parties responsible for cleaning up SSFL have long been trying to get out of their cleanup obligations. The most recent scheme is to try to make the polluted land a park and thereby use grossly weaker cleanup standards, leaving about 98% of the radioactive and toxic chemical contamination not cleaned up.Sign the petition to demand that the commitments for a full cleanup of SSFL must be carried out before it is considered for a National Monument or for inclusion in Rim of the Valley Corridor! NBC4 broadcast a new segment on May 4, 2016 in its ongoing investigation of the Santa Susana Field Laboratory (SSFL) that examines a new study commissioned by American Jewish University about the migration of SSFL contamination to its Brandeis-Bardin Institute property, home of Camp Alonim children’s camp. Say NO to Boeing’s unacceptable risk! Sign the petition to Senators Boxer and Feinstein for full SSFL cleanup! A new analysis of Boeing’s risk assessments shows shockingly high contamination and risk – both now and after its weak proposed cleanup. If Boeing prevails, the vast majority of contamination on its property at SSFL will not be cleaned up and nearby communities will continue to be at risk through offsite migration. This is unacceptable! Please sign a new petition, to Senators Boxer and Feinstein and share widely with your friends and neighbors! NBC aired the fifth segment of its year-long investigation into SSFL on December 14, 2015. The segment, entitled “LA’s Nuclear Secret: Call For Action,” revealed that the site is even more contaminated than previously known. Read about RCC's long struggle to cleanup Rocketdyne and protect our communities in "A Loss of Innocence."